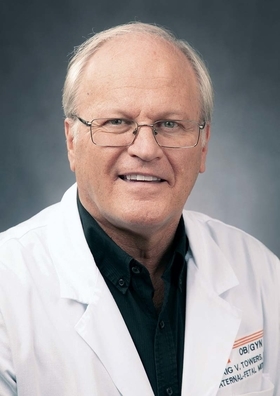 “This is doable, but we have to set up behavioral programs because otherwise the relapse rate is too high,” said Dr. Craig Towers at High Risk Obstetrical Consultants in Knoxville, Tenn.
Dr. Craig Towers' pregnant patients who were addicted to opioids frequently asked him whether he could help them get off drugs so their babies wouldn't suffer agonizing withdrawal symptoms after birth. Towers and his group, High Risk Obstetrical Consultants in Knoxville, Tenn., see 300 to 400 opiate-addicted pregnant women a year. Like most doctors across the country, Towers would tell them no, because detox would risk premature labor or even fetal death. Instead, he would recommend that they receive drug maintenance therapy with methodone or buprenorphine through their pregnancy. That's the long-standing opinion of the American College of Obstetricians and Gynecologists, even though it means newborns are likely to suffer neonatal abstinence syndrome, or NAS, and have to be hospitalized and slowly weaned off the opioid drug. But, challenged by his patients, Towers dug into the research literature and found studies suggesting that detoxification during pregnancy is not harmful. So he and his colleagues launched a five-year observational study of 301 opiate-addicted pregnant women who underwent four detox methods. The results were published recently in the American Journal of Obstetrics and Gynecology. They found no adverse fetal outcomes related to detoxification. In addition, among women who went through detox with accompanying intensive behavioral therapy, only about 17% of their newborns suffered NAS, primarily because the mother had relapsed. The findings may prompt more physicians to break with standard clinical practice and offer detox therapy during pregnancy, which could sharply reduce the number of babies with NAS. Tennessee doctors are launching programs for addicted pregnant women that combine detox with behavioral therapy, breaking with standard practice to keep them on drug maintenance therapy. Hudak said doctors who wanted to try detox with pregnant women often were blocked by hospitals, fearful of the liability risk. The number of babies born with NAS in the U.S. grew five-fold between 2000 and 2012, with more than 21,000 infants suffering from the syndrome in 2012, according to the National Institute on Drug Abuse. Babies born with NAS may suffer seizures, high fevers, vomiting, diarrhea and severe distress. They require weeks of inpatient treatment with drips of morphine or methadone. The long-term effects of this drug treatment are unknown. Hospital care typically costs $50,000 to $60,000. In Tennessee alone, treatment for NAS babies cost the state Medicaid program more than $60 million last year, Towers said. If detox could reduce the number of NAS cases, he said, the state could take those savings and fund addiction treatment programs for pregnant women. He's currently talking with Medicaid officials about developing such programs. Towers is also working with Dr. Geogy Thomas in the small eastern Tennessee town of Jellico—where about 60 babies with NAS were born last year—to launch an inpatient detox program for pregnant women. Thomas is trying to persuade Medicaid managed-care plans to adequately pay for these services. “The best thing is to get moms off drugs when they are pregnant, when they're concerned about their fetus, and we've got their attention,” Thomas said. In Towers' study, one group of patients received slow outpatient treatment with buprenorphine combined with intensive behavioral healthcare; the NAS rate for their babies was 17.2%. Two groups received rapid inpatient treatment with buprenorphine. One of the inpatient groups also received residential behavioral care; their NAS rate was 17.4%. The other inpatient group did not receive residential behavioral care and had an NAS rate of 70.1%. A fourth group was incarcerated and went through cold-turkey withdrawal. Their babies' NAS rate was 18.5%.